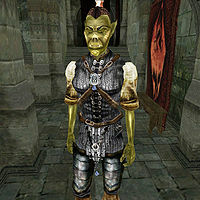 Ulumpha gra-Sharob is an Orc healer who sells ingredients, potions, and minor training in Medium Armor, Alteration, and Mysticism in Fort Darius in the town of Gnisis. She is a restocking vendor of the following ingredients: Bonemeal, Frost Salts, Hound Meat, and Small Kwama Egg. She is wearing an Imperial chain cuirass with matching greaves and a pair of netch leather boots. She is also wearing a common shirt with matching shoes and she is wielding an Imperial shortsword. Like all Orcs, she has a natural resistance to magicka, and can boost her health, fatigue and attack for short periods, at the cost of agility. Aside from that, she knows the following spells: Strong Feather, Ulms's Juicedaw's Feather, Fourth Barrier, Fifth Barrier, Calm Creature, Sotha's Mirror, Vivec's Feast, Spell Absorption, Seryn's Blessing, Strong Resist Fire, Strong Resist Frost, Strong Resist Magicka, Strong Resist Poison, Strong Resist Shock, and Dispel. This page was last modified on 23 November 2018, at 06:16.